Private Leaver was the son of John and Susannah Leaver; He was the husband of Edith Leaver, of 9, Church Square, Worsthorne, Burnley, Lancs. News reached Worsthorne on Thursday morning that Pte. Richard Leaver, of the Kings Own Royal Lancaster Regt., had been killed whilst waiting orders to go over the top. This sad news was conveyed to his wife in a very sympathetic letter received from the deceased soldiers officer, who was himself wounded soon after. Pte. Leaver was a native of Worsthorne, and was one of the best known men in the rural district. He was an excellent vocalist, and a keen cricketer and footballer, being a member of Worstorne St. Johns cricket team when they were in the Ribblesdale Junior League. He was a bright, genial character, full of good humour, and an excellent raconteur. For many years he was an official of the Worsthorne Agricultural Society, and a chorister at St. Johns Church. He was also a member of the Worsthorne Pierrot Troupe, and freely gave his services on any good cause. The deceased, who will be much missed in the village, was in his 42nd year, and leaves a widow and four young children, for whom the greatest sympathy is felt. Pte. Leaver was uncle to Lieut. Gray Leaver, of the Burnley Recruiting Office, and also to Lieut. 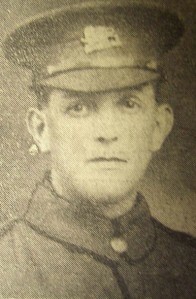 Harry Gray Leaver, of the Lancashire Fusiliers, who has been wounded in France. Pte. Leaver, who only went to France in March, was one of the first to attest in Worsthorne, and enlisted voluntarily last December. He was employed on the motor of Messrs. J. R. Greenwood and Co., Ltd., Worsthorne, and his employers had an appeal in for him. The following letter has been received, dated August 5, from Second-Lieut. Mackey by Mrs. Leaver: - Dear madam. – I am taking this opportunity to express the deep sorrow of myself and each man of No. 9 Platoon at the loss of such an excellent soldier and man as your husband. His death was instantaneous, as a shell fell in the bay in which he was sitting, and I myself had just been speaking to him and the other poor boys who were with him only two minutes before. This occurred only an hour or two before we went over the top, and your husband was to act as my runner in the operation. Although he was only a few months with us, his excellent work and continuous good humour had already impressed me so much that I had suggested his name for promotion, which he undoubtedly would very soon have obtained. I myself was wounded in the arm just after reaching our objective, about half an hour after going over, so I trust you will accept this excuse for not writing soon. He had often been on dangerous work with me, and at all times showed the greatest courage, and inspired good work out of every person around him. His loss to me is a personal one for he was continually with me, and I regarded him as a friend as well as one of my platoon. Captain Briggs (our company commander) and all C-Company and myself again wish to express our deepest sympathy in your great loss.